My favorite part about being home schooled was all the time I had to read. I was an avid reader throughout high school. Every time my mom found a new booklist of recommended classics, I would pore over it, find the titles I hadn’t yet read, and order them through the library. Anything under a couple hundred of pages I would finish in one sitting, sitting on the couch all afternoon till I had read the book cover to cover. There was one book, however, that I remember being forced to read. Every other day for a month my mom would ask the dreaded question, “Have you finished David Copperfield yet?” No, I grumbled. It’s so torturous! Why are you making me read this? Against my will, the awful tome was eventually surmounted, and when I reached the conclusion, I came to my own conclusion that David Copperfield was indeed a most excellent story. I loved the ending, and loved that I had reached the end, but I most definitely did not love the experience. Great Expectations filled me with the same repulsion as its sister novel. I barely reached the halfway mark while I was in high school, and this time I was not forced to finish. When I read it for a literature survey class in college several years later, I discovered that I did indeed like the ending very much, but the mountain path full of steep climbs and grueling switchbacks made the view from the top a little too much effort to be undertaken for mere pleasure. When I became a literature teacher, I had the privilege of selecting my own curriculum for my Modern Lit class; it encompassed literature from 1600 to the present. The list of books I wanted to teach was long–too long–and I was forced to make some difficult choices as I pared it down to a manageable page amount for my high school students. “They really ought to read a Charles Dickens,” I thought to myself, wrinkling my nose in distaste at such an unfortunate necessity. I dutifully found a place for A Tale of Two Cities on the booklist and determined to grit my teeth and bear it as best I could. As the term advanced, I saw that I had been a little bit too ambitious with my booklist. Like the pioneers in their Conestoga wagons, I was forced to lighten the load. I knew exactly which cargo to jettison. Dickens was tossed by the wayside and I continued on my travels, confidently secure that I would never have to turn his pages again. Charles Dickens and I have been strangers for ever so long, but a few weeks ago we became reacquainted. 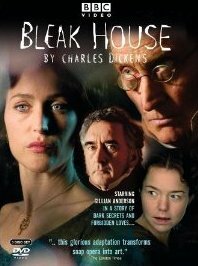 Seeing a montage preview of several BBC period pieces, I–on a whim–ordered the Dickens’ miniseries Bleak House from the library on DVD. I had heard good things about it from my mother, but I was still skeptical. But library movies are free, so you don’t have to watch them if you don’t want to, right? My husband David surprised me by agreeing to watch the series with me and so we began a two week long adventure through three discs and eight and a half hours in Victorian England. The plot was as typically Dickensian as the books of his that I had read, but somehow the screenwriter had managed to convey all of the mystery, the romance, and the delightfully oddball characters without any of the torturous experience inherent in Dickens’ prose. Every night we looked forward to watching another episode, and the night we finished it, we stayed up late watching five episodes in a row. I don’t intend to commit to anything so rash as recounting the plot of Bleak House in this blog post, but I will confess that watching this miniseries has made me an almost-fan of Charles Dickens. It even makes me want–just a little bit–to go and read the book…although I know I’ll regret that thought as soon as I crack the cover. Nicely written review! I’ve been wanting to watch this for a long time, after all the positive comments I’ve heard about it, but it sounds so tedious! Someday I’ll brave it. I love this series, and have watched it several times since it was first on Television, as well as several other Dickens adaptations. I have never read one novel of his though, and the length might be a bit off putting.